It's May 1st and that means A LOT OF GREAT THINGS when it comes to Close To My Heart! 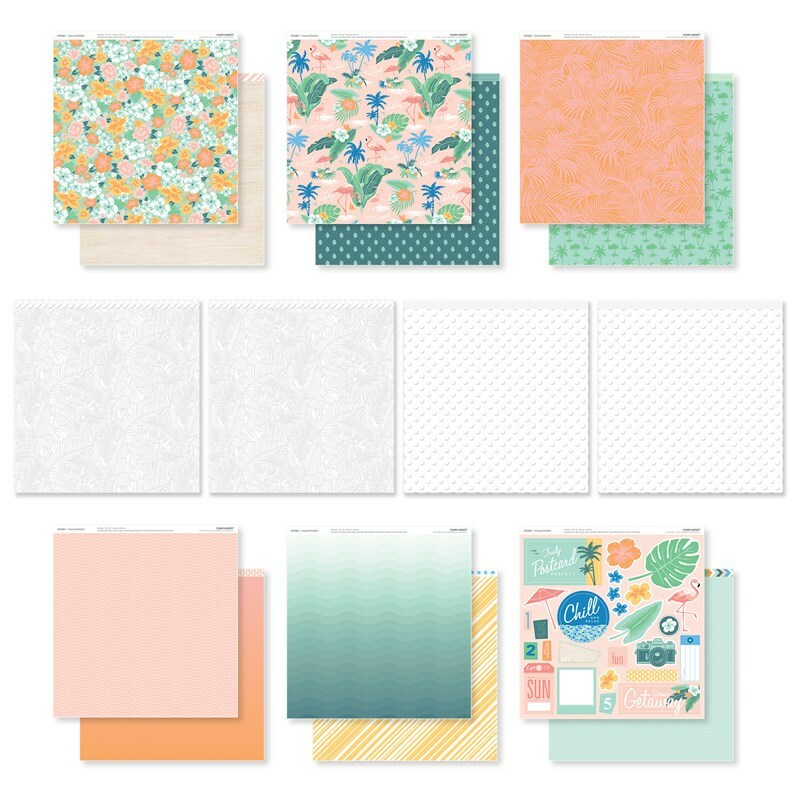 Today is the day we release a NEW Seasonal Expressions 2 Idea Book, filled with wonderful new products and beautiful artwork, kicking off National Scrapbooking Month in a BIG WAY! You can view a digital copy of it online and better yet, when you place an order, you will get a hard copy when your products arrive! You will definitely want one in your hands so you can make your wish list. There's no doubt you'll want plenty of new items! If you don't have a Consultant and would like one shipped to you, contact me directly and I am happy to mail you one. In fact, we also have an exclusive campaign called "Postcard Perfect" which includes a bundle full of fabulous product. I am thrilled you have stopped by my blog today where I and several other Consultants are highlighting this adorable stamp set, the May Stamp of the Month, "Classic Summer Bash". 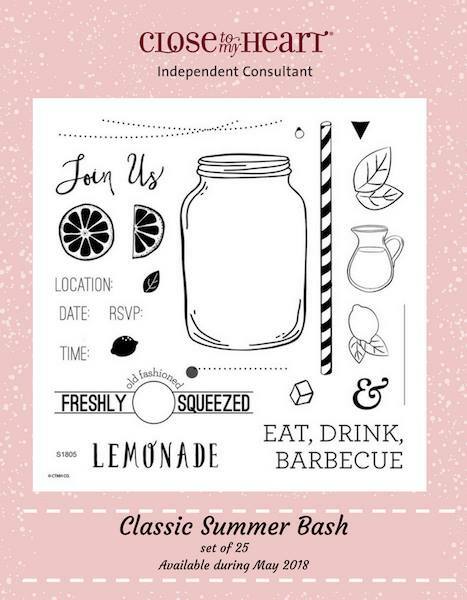 These 25 images are perfect for creating an invitation for a summer event or for other fun projects! 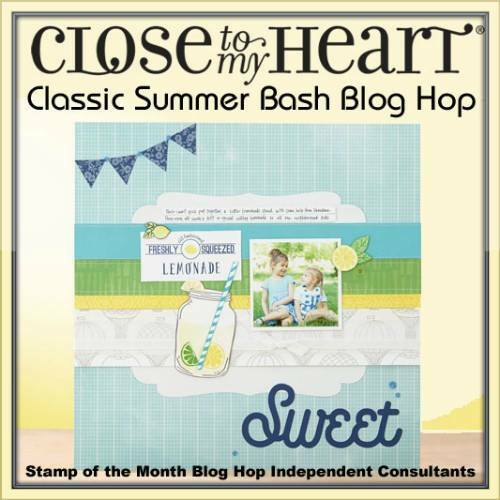 You are bound to be inspired as you make away around this Blog Hop. If you are coming from Michelle Stewart's Blog, you are on the right track. You can find a complete list of participants here. I had fun creating this greeting card. As Close To My Heart Consultants we have access to some private groups where artwork is shared. Viewing what others create helped inspire me and I love what resulted. It was fun making the papercrafted lemonade and I couldn't resist adding a Raspberry-colored straw. The jar was stamped in Pewter ink, onto a piece of patterned paper from the Adventure Fundamentals paper packet. 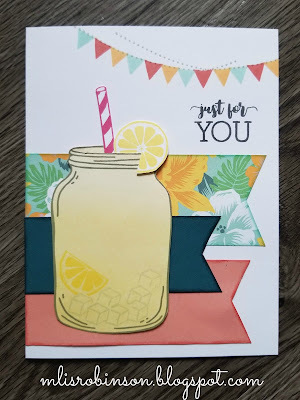 It has an ombre' pattern in Lemon, perfect for my card. To make the ice cubes look dimensional, I used the masking technique bystamping an ice cube on a sticky note. Then, I cut it out. By placing the image on top of a stamped image, I was able to stamp a cube again, without disrupting the previous image. You might be wondering where I obtained the floral paper. It comes from our special kit for this month called "Postcard Perfect", perfect for celebrating National Scrapbooking Month! You can buy the paper packet by itself OR there is a bundle being offered that includes a coordinating stamp set AND a Cut Above Scrapbook Kit. Click here to view all of the related products. This stamp set and paper are just one of the few items to be excited about this month. Be sure to peruse the contents of the online Idea Book and contact me, or your Consultant, if you have any questions. To continue on the Blog Hop, please visit Melinda's Blog to view the artwork she has to share with you. We always appreciate you leaving a comment, so please consider doing so before you head her direction. Wishing you a FABULOUS month full of Postcard Perfect Memories! Great use of all the May Promo's. Cute...cute! I need to use ice cubes & the banner on my next creation. :) There is so much goodness in this one stamp set! An adorable card! Adorable, I just love this card! Beautiful card. I love the papers you selected. Love how you pulled the colors from the paper to create the banner, great card. Making me THIRSTY for this weekend...CUTE card, my friend!!! What a cute card! I love the banner background. Great details all around. Love your card. How perfect to use the ombre yellow for the jar. Super cute card, I love the bright colors!